It’s that time of year again! Time to start thinking about what you are going to gift to the ones you love this holiday season. 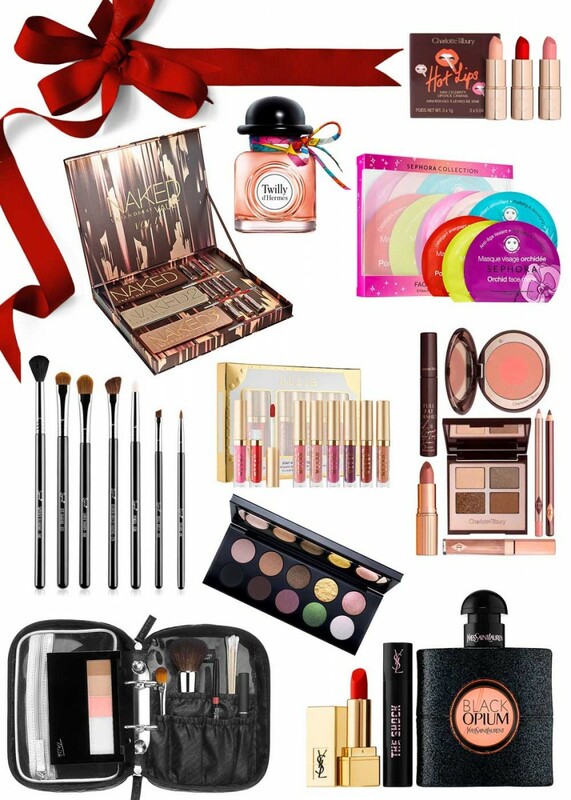 I’m starting off this year’s Holiday Gift Guide’s with what else than with the ultimate beauty gift guide. I’ll be sharing some of my favorite eye palettes, the best sets for lipstick lovers, brush sets for all, and so much more. Eyeshadow palettes are my favorite when it comes to makeup products. I just can’t get enough of them! They’re so convenient. Not only because of the variety of shades available, but they are also helpful in creating a look. Eyeshadow palettes make a nice gift for those who love bold eye looks, as well as to the ones that prefer a subtle, neutral look. For those who aren’t afraid to play with color, these palettes by Pat McGrath Labs would make an awesome gift. They are a little on the pricey side for an eye palette, but it will be greatly appreciated from the makeup lover. Another palette worth gifting is a Natasha Denona palette. The Sunset palette is a popular one, and the Star Eyeshadow Palette has a nice mix of neutrals with a few colors thrown in. Speaking of neutrals, the Urban Decay Naked Vault is a must have for makeup lovers. It includes 3 of their popular Naked shadow palettes, as well as 9 lipsticks. If you are gifting someone an eyeshadow set, it’s also a nice idea to add along a couple brushes. I gifted my mom this Smashbox Matte Eyes Mini last year and made sure to include a brush to go along with it. She isn’t really into makeup but was wanting a neutral eyeshadow set for when she went out in the evenings to dinner or get togethers. I threw a brush in with the palette because I knew it would make things easier for her! You don’t have to be a beauty pro to love a good lipstick. Actually, many women prefer to just throw on a bold lipstick to complete their look instead of fussing around with eye makeup. One thing is for sure, any beauty lover would be happy to receive a nice lipstick set. This MAC mini lipstick kit is a good one. It has a good range of shade from nudes, pinks, and reds. It’s also at a great price point for 10 lipsticks. If you are willing to spend a little more, and are looking for something unique, then take a look at the Christian Louboutin Lipstick set. I have yet to try these out but i think any luxury lover and makeup collector will appreciate them. Some other options for beauty gifts are sets that include a little bit of everything. A few eyeshadows, a lipstick, and maybe even some mascara to create a full look. This Charlotte Tilbury Goddess set is the perfect example. It includes 7 products. 4 lip products, 2 for the eyes, and one for the face. A makeup carrier is also a great idea, especially for someone that travels. Kate Spade always has cute makeup bags in all sizes, but you can never go wrong with a classic, quilted bag.